The animals have invaded Jungle Speed! 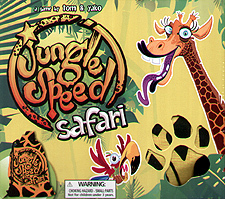 A completely "wild" set of rules, cards and totems for a brand new Jungle Speed experience! On your turn, flip a card. Is the animal hungry? Be quick and Grab the right food totem. Is the animal angry? Calm him down by imitating him! And that's not all... The chameleon and the hunter will test your reflexes.